Now that we are in the final weeks of the 2014-15 COC season, it means some members of the Ensemble Studio will be finishing their tenure. To mark the occasion, there's a series of farewell recitals at the Richard Bradshaw Amphitheatre. Two weeks ago, we had a superb outing by mezzo Charlotte Burrage and baritone Clarence Frazer. 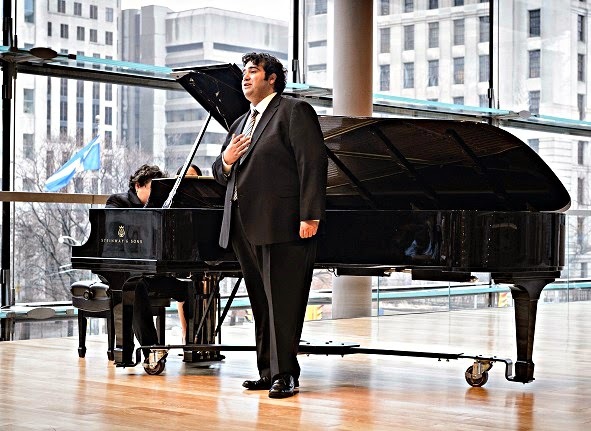 This time around, we have tenor Andrew Haji and bass-baritone Gordon Bintner in a Liederabend, albeit at noon. To my ears, Haji and Bintner are two of the best young voices in Canada today. So it's a bit sad that they are leaving, but given their prodigious talent, it only means they are moving onto greater things - "Zu neuen Taten!" as they say in Gotterdammerung! Bintner began the recital with six songs from Schubert's Schwanengesang. These so called Swan Songs were composed by Schubert in his last years, and the 14 songs don't seem to have a thematic unity. The ones Bintner chose are set to text by Heinrich Heine. These are particularly challenging songs, if for no other reason than the fact that they are heavier and more serious in nature than the ones set to text by Rellstab and Seidl, also part of the cycle. Total concentration and commitment by the soloist is absolutely essential. Unfortunately, throughout his performance, there was a constant, distracting noise coming from a member in the audience, loud enough to be bothersome to me, and I am sure to the performers as well. I gave Gordon Bintner absolutely full marks for maintaining his composure throughout. He did extremely well under the circumstances, singing with beauty of tone and plenty of expression. The tempo taken on a couple of the very serious songs - like Der Doppelganger and Am Meer - was very slow and it taxed Bintner's support to keep the tone as steady and rock solid as possible. I couldn't help thinking that if he had programmed a couple of the lighter songs like Taubenpost and Liebesbotschaft, it would have given it a bit more variety and lighten the mood. But the others are not set to text by Heine, so I understand the decision. If I were to quibble, perhaps a bit more piano - which the singer can do beautifully - would have been preferable. In any case, this performance amply demonstrated that Bintner can perform under less than ideal conditions and still comes out a winner. With his beautiful, virile low baritone and dashing stage presence, he will go far. 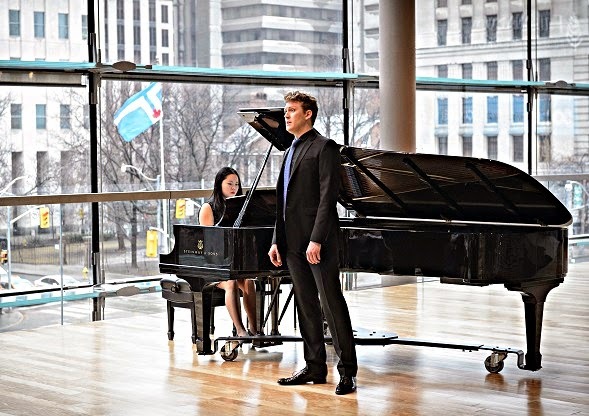 Jennifer Szeto, who was impressive in the recital last time with Burrage and Frazer, continued to show why she's one of the most promising of young collaborative pianists in Canada. Fortunately, by the time Haji started his cycle of Schumann's Dichterliebe, the disturbance had stopped. He sang the first edition of this cycle, which contains the 16 original Heine songs. Pianist Liz Upchurch, head of the COC Ensemble Studio, announced at the beginning that the cycle was dedicated to the memory of the great Dietrich Fischer-Dieskau. (That actually caused a bit of confusion in some people in the audience, thinking that FiDi just passed away . Of course he died quite some years ago! This cycle was closely associated with the great baritone.) Haji has a glorious tenor, bright, clarion, sweet, rich, always used with musicality and discerning taste. To sum it up in a few words, his singing on this occasion was marvelous. He and Upchurch gave this same program in his recent New York recital debut, so the piece was extremely well rehearsed. It showed, in their absolute security and freedom throughout the performance. I was very impressed with the impeccable German diction of Haji, and he really tried to tell a story with the text. As a tenor, the high tessitura of Ich grolle nicht posed no problem for him, the high A perfectly true. And there was liberal use of soft dynamics where appropriate. I also liked his dramatic urgency - he brings a poetic impulse to these songs that's very endearing. Liz Upchurch played marvelously, arguably the best I've heard her in recent memory. I must say this was one of the most satisfying Lieder recitals I've heard in recent years. The audience was extremely appreciative, giving the performers a standing ovation. One could argue North Americans tend to stand at a drop of a hat, but in this case, it was richly deserved.